Business Subsidies or Road Tax Increase? In May you will decide at the Ballot Box. What do Lansing lawmakers do when they commit “grand theft” of our road fund monies on subsidies for economic development instead of on Michigan roads? They let the taxpayers hang themselves by voting on a ballot proposal “tax increase” holding our roads hostage if we don’t vote yes. The MEDC is like a bad movie titled, Michigan Taxpayers Subsidize the Wealthiest Businesses or how Michigan Taxpayer Funded Subsidies supply funds for Corporation profits. “These subsidy awards are getting out of control,” said Philip Mattera, research director of Good Jobs First and principal author of the report. In 2005, Toyota landed a $38.9 million tax credit from the Michigan Economic Development Corp.’s Michigan Economic Growth Authority (MEGA) board to fuel the expansion of its technical center in York Township. Michigan Taxpayers Pony Up Subsidies for Toyota…Yet Again! What’s the old saying, third times a charm? In this round of taxpayer funded subsidies The Michigan Strategic Fund has awarded the automaker another $4 million. In addition to this subsidy, Toyota received a State Education Tax Abatement with an estimated value of about $1.3 million. The Michigan Economic Development Corporation announced that Toyota has been awarded $4 million. York Township is additionally considering approval of local incentives in the form of a 12-year property tax abatement that could save the company up to $4.6 million. The project was secured through a collaborative effort involving MEDC, York Township and Snyder’s Ann Arbor SPARK. One of Ann Arbor SPARK board of directors are: Charles Gulash, vice president, Toyota Motor Engineering & Manufacturing. Can you say conflict of interest? This isn’t the first incentive dance Toyota has been to. In 2008 as a Campaign Manager for a State Rep. candidate I attended a meeting with him in York Township and he spoke at that meeting against the first subsidy. The promise then was 400 jobs that never materialized! Toyota said it plans to build a new facility on its Michigan campus “subject” to final approval of state and local “incentives” to accommodate the 250 workers. That subject to “local incentives” is code word for us the Michigan taxpayers who will pony up through the “failed” MEDC just mark my words! Why not the “Comeback State” Michigan? I’ll tell you why it’s no different than California! Michigan will get 250 jobs in Snyder’s Ann Arbor if the taxpayer subsidies are sufficient which they already received in 2008. Take a look at the incentives Toyota received from different state and local offices to locate their plant in certain locations. From Wikipedia: Toyota has received a little over a billion USD in federal, state, and local government tax subsidies and incentives including: * $323.9 million in subsidies for the plant in Tupelo from Mississippi taxpayers. * $371 million in subsidies for the Georgetown plant from Kentucky taxpayers. * $227.5 million in subsidies and tax incentives for the Tundra plant by Local, Texas, and U.S. taxpayers. Michigan has the most megadeals, with 29, followed by New York with 23; Ohio and Texas with a dozen each; Louisiana and Tennessee with 11 each; and Alabama, Kentucky and New Jersey with 10 each. 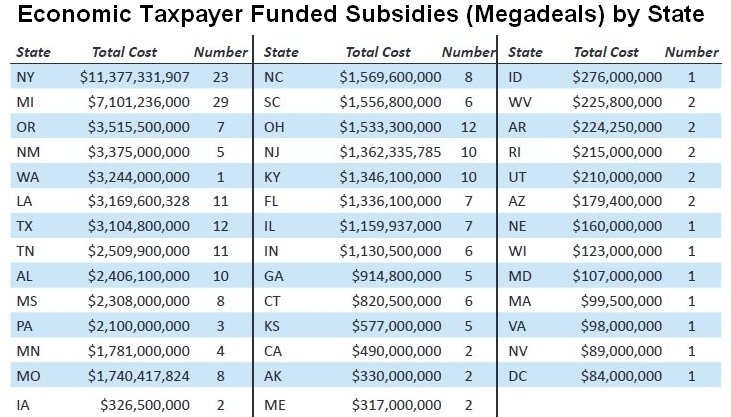 “Megadeals” are defined as taxpayer funded incentive packages (subsidies) worth more than $75 Million. This does not include those subsidy giveaways under the $75 Million benchmark such as the Film and Movie Producer subsidies given away here in Michigan or smaller business subsidies. In dollar terms, New York is spending the most, with megadeals totaling $11.4 billion. 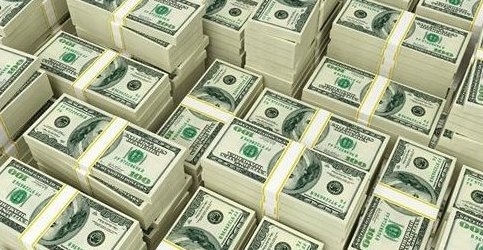 Next is Michigan with $7.1 billion, followed by five states in the $3 billion range: Oregon, New Mexico, Washington, Louisiana, and Texas. Twenty-one states have megadeals costing $1 billion or more. Some of the deals involve little if any new-job creation; indeed, one in ten of the deals involve the mere relocation of an existing facility, often within the same state and sometimes within the same metropolitan area. Some of these retention deals were granted in so-called “job blackmail” episodes. The La-Z-Boy Corporation in Monroe pulled one of these so-called “job blackmail” episodes when it threatened to move out of Monroe unless the taxpayers of Michigan provided subsidies for building their new headquarters, the MEDC caved and awarded then up to $12.7 Million in taxpayer money. Furniture maker plans to build a new world headquarters in Monroe after state approval this week on a $3.7 million incentive package. This “taxpayer funded” package could be worth $12.7 million over nine years when the package’s grants and tax breaks are combined and that is contingent on La-Z-Boy adding 50 jobs. Dan Swallow, director of economic and community development for Monroe, said the two grants and the tax abatement were paramount to keeping La-Z-Boy fully committing to staying in Monroe. The company had stated it would remain in Monroe if everything could be worked out, but if it couldn’t, it might be forced to go to another county or state. Right after La-Z-Boy got our tax dollars the company reported third-quarter profits that soared. Michigan-based La-Z-Boy said Tuesday its operating income was up 37 percent in the fiscal 2013 third quarter, to $23.3 million, compared with $17 million in the same quarter of 2012. The company ended the quarter with $112 million in cash and equivalents. Are corporate subsidies worth the money? History of the MEDC: The Michigan Economic Development Corporation (MEDC) was started by Republican Governor John Engler expanded by Democrat Governor Jennifer Granholm and put on steroids by Governor Rick Snyder. John Engler assumes leadership as Business Roundtable Preesident. Business Roundtable (BRT) is an association of chief executive officers of leading U.S. companies working to promote crony public policy. Economic Development Subsidies Report Megadeals: By Philip Mattera and Kasia Tarczynska with Greg LeRoy. “Megadeals” are defined as taxpayer funded incentive packages (subsidies) worth more than $75 Million. This does not include those subsidy giveaways under the $75 Million benchmark such as the Film and Movie Producer subsidies given away here in Michigan or smaller business subsidies. Click “Full report” in the link below to view how over $7 Billion of your tax dollars has been wasted on subsidies here in Michigan since 1986.